Are you planning a big Christmas dinner but don’t want to actually do the cooking? By ordering a festive takeaway turkey dinner you can have the best of both worlds. There are several places in Dubai that offer prepared meals for the holidays. Few offer home delivery, while most require you to pick up the order on location. Unfortunately, this can’t be a last-minute fix when the grocery store runs out of turkeys on Christmas Eve. Different restaurants, catering companies and hotels have have different cut-off days for ordering, so make sure to order your turkey in advance. Take all the stress out of your festive preparations and just pre-order a unique package prepared by our chefs. Choose from a whole roasted turkey or beef rib eye; with chestnut stuffing, roast potatoes, roast root vegetables, buttered Brussels sprouts, chicken sausages in blankets, gravy and cranberry sauce. Share your family traditions in the heart of your home, with our turkey takeaway service, the ideal stress-free solution for the festive season. Allow the chefs at Nineteen to create a traditional festive feast, prepared to perfection with all of your favourite trimmings. Indulge in a family feast at home this festive season with Turkey Takeaway Hampers. Simply pre-book and enjoy the fresh and vibrant hampers full of muffins, mince pies and an array of delectable goodies. The scrumptiously prepared turkey, with all the trimmings, will complete your day of festive celebrations. Make your seasonal feast complete with juicy turkey takeaways with all trimmings prepared by a talented culinary team. Families dining at home will be spoilt for choice with our takeaway options, which include a perfectly roasted turkey and all the trimmings. If you don’t want to do the cooking this festive season, visit our Academy Café and let our team of experienced chefs prepare a delicious turkey with all the trimmings for your festive celebration. Roast Butterball Turkey accompanied by roasted root vegetables, sage and onion stuffing, chipolata sausages, roast potatoes, gravy and cranberry compote. For gourmands who want to celebrate at home, but with something a cut above the average home-cooked meal, the Turkey Takeaways at 25° 55° Café Bistro are ideal choices. The perfectly roasted turkeys create a feast that will serve six persons, so invite all your family and friends home for a magnificent treat! If the thought of slaving away in the kitchen leaves you hot and bothered, then a tasty alternative is a made-to-order Turkey Takeaway. We would be delighted to assist you with your festive lunch or dinner at home with our succulent offerings. The crispy and perfectly roasted turkeys will be served with pudding and all the trimmings, which you can order as per your preference. We know you’ve been waiting for this, the traditional roast turkey takeaway is back! Take home a beautiful and succulent traditional roasted whole turkey between 21 and 31 December 2014. Latitude Creations at Jumeirah Beach Hotel offers a tantalizing array of delectable goodies for the Festive and New Year season. May we suggest that you place your orders in advance by completing the turkey form and send it to us via email to latitudecreations@jumeirah.com. Orders may be placed from November 2014, for collection is from 20 December to 26 December, 2014. Look forward to homemade cookies… mince pies… Stollen cake… gingerbread houses… Traditional Christmas goodies from around the world await you in the Aspen retail shop. We also accept special turkey takeaway orders. Savour the finest cuisine and authentic delights during the tantalizing promotion. Turkey to Go offers a fully prepared 10 kg stuffed bird with all the accompaniments you expect, for AED 499, available at the Atrium Café. 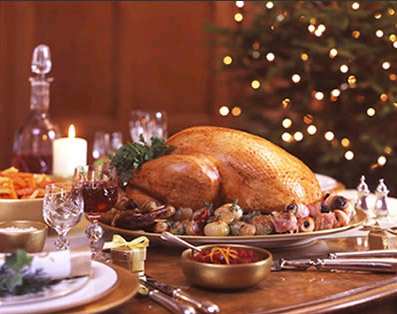 The hotel offers two delicious options for a whole roast turkey with Brussels sprouts, glazed carrots, oven roasted potatoes, roasted chestnut ragout, cranberry sauce, celeriac lemon cream and gravy. A turkey for 6 to 8 people (5.5 kg – 7.25 kg) is priced at only AED 520 while a turkey for 8 to 10 people (7.25 kg – 9 kg) turkey is priced at AED 750. Furthermore, would you fancy having the turkey delivered straight to your doorstep? The hotel can deliver this feast directly to your home for an additional AED100 (location within a 30km radius from the hotel). Be the consummate host as you delight friends and family to a traditional celebration at home. Just pre-order a roasted whole butterball turkey hamper from Al Bayt at the Palace Downtown Dubai, served with Brussels sprouts, buttered carrots, roasted parsnips, roasted potatoes, traditional stuffing, turkey jus and cranberry sauce. For a stress-free celebration, order an entire festive meal from The Ritz-Carlton, DIFC, including a selection of delicious appetizers and desserts, and a choice between roast turkey or roast Angus strip loin with all the trimmings. 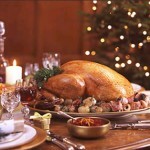 Take the stress out of cooking your festive lunch by pre-ordering your turkey with us! Prepare yourself ahead of time and avoid any last-minute kitchen chaos by ordering one of our fabulous roast turkeys, served with roasted root vegetables, roasted potatoes, cranberry sauce, turkey gravy, bread stuffing and apple cinnamon crumble. With the food taken care of, you can just sit back, relax and enjoy the company of your loved ones this season! * 48 hours advance notice and full pre-payment for turkey takeaway orders are required. Click here to view the full menu (pdf).